Colouring books for adults, which barely existed six months ago, have exploded as a trend, with major publishers from several countries jumping on board. 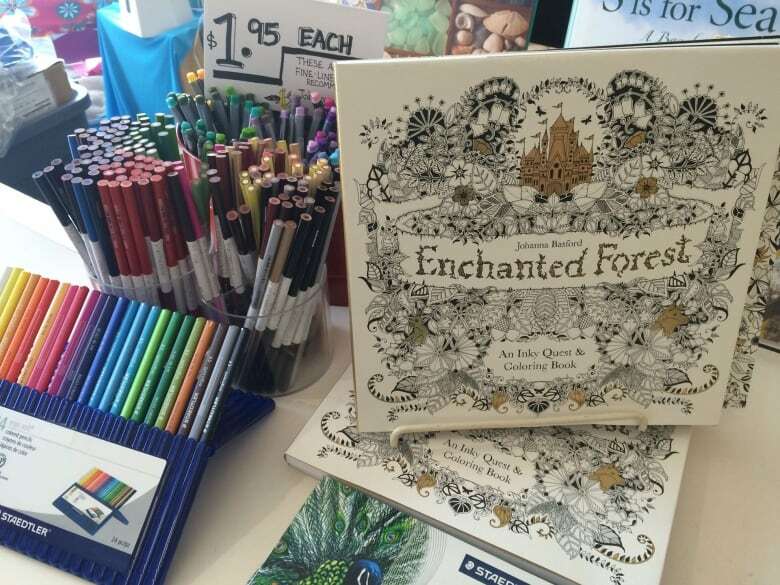 Colouring books for adults, which barely existed six months ago, have exploded as a trend with major publishers from several countries jumping on board. It started with books of black and white patterns called zentangles. Over just a few months, however, the market boomed. Now colouring books are available in dozens of themes, with designs ranging from cityscapes to kaleidoscope patterns. Many of them are marketed as a way to relax and relieve stress. Prince Edward Islanders Zoey Mossman and Alexandra Dekerf are avid colouring fans. For Dekerf, the positive effects of colouring start as soon as she picks up a marker. "You have to slow down," said Dekerf. "You can't just zoom through a page. You have to pick your colours and decide where you're going to go next." Mossman said it's easy to lose herself in a drawing. "It's very easy to think I'll just work on this for 10 or 15 minutes and the next thing you know, it's like, I want to do this one more section, or I want to do this one more colour, or I'll get the leaves done tonight," she said. "The next thing you know, it's time to go to bed. It is really meditative." 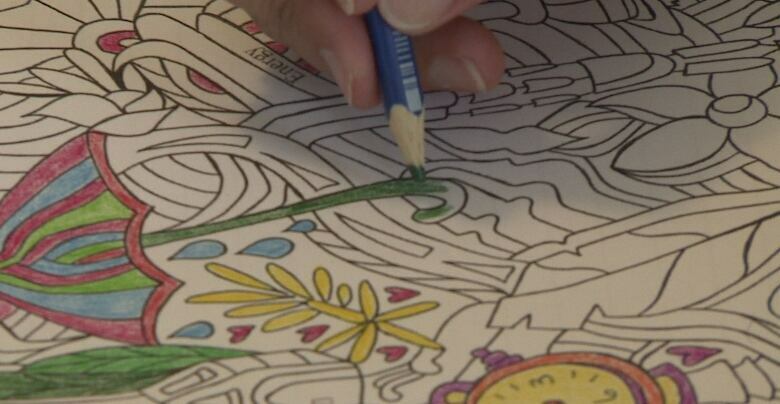 The colouring books are part of an international trend. Amazon lists 88 titles, and some titles in the U.K. have sold tens of thousands of copies, the Guardian reports. For booksellers, the hard part is keeping them on the shelves. 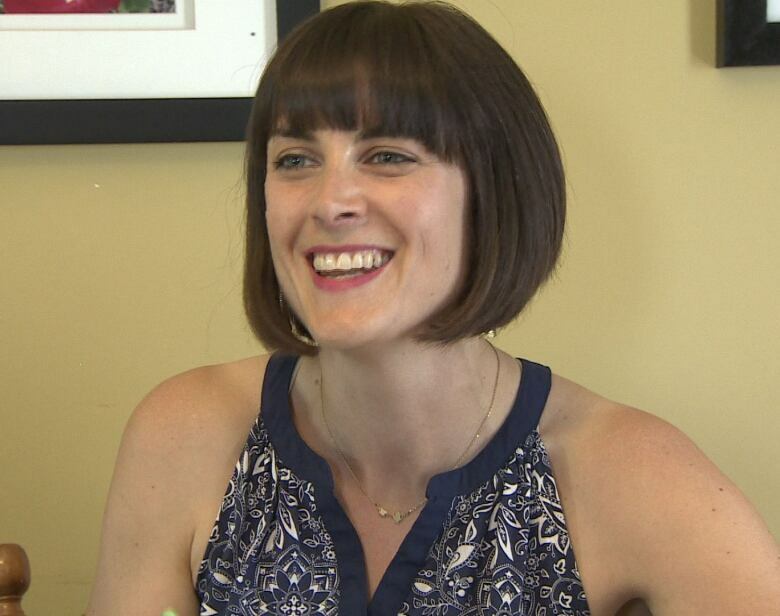 Lori Cheverie, manager at Bookmark in Charlottetown, said the store is experiencing a colouring book boom. "About two months ago, it just exploded. And every day, I'd say a third of our sales have something to do with colouring," said Cheverie. "Whether it's looking at the markers, talking about the books, telling us what they've done. everybody's interested." Over the last few months, P.E.I. artist Nadine Staaf has published two colouring books for adults and has a third coming out soon. The books are filled with blank designs of plants, animals, or abstract patterns. They're similar to children's books, with a few tweaks. "The detail, the finer lines — you really need to be focusing, whereas younger children don't tend to colour with as much focus I find," she said. "I have been surprised by how excited people are by it, particularly adult women, which I think is just so cool, that people are excited by this thing that I've created." Staaf's books also focus on calming the mind and dealing with stress. She's added journal pages to the last book, and fills them with inspirational words and quotes to help the artist relax. Staaf said the response has been overwhelmingly positive.